The Must-Have Shoes for This Summer! The sun is finally coming out and summer is almost here! It’s time to break out the sandals, wedges, flip-flops, etc. 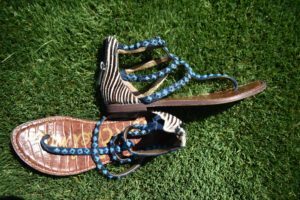 and I am sharing my summer shoe guide. 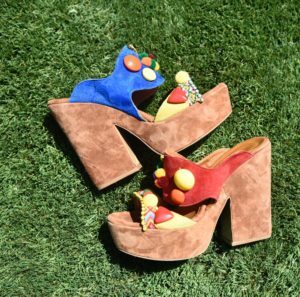 The must-have shoes to take you through this summer! A Flip-Flop Everyone needs a basic flip-flop. My all-time favorite flip flops are my black Sam Edelman’s. You really can’t go wrong with that brand. I have had them for years and they are my go-to when I am on the go! A little bit of color and flair! A Dressy Flat Sandal A dressy flat sandal is a sandal with a little bit of flare. Whether it has jewels, fringe, beads or even a tie around the ankle, your catchy sandal can dress up a plain maxi dress, a pair of shorts and solid top, or a big pair of flare jeans. These are a must-have for me. You can find cute gladiator sandals at Sam Edelman for $40.00 to $90.00. 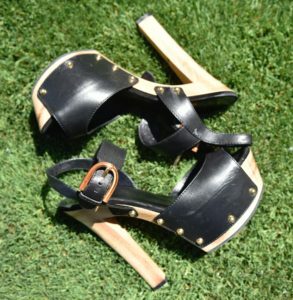 Last but not least, A Unique Platform Sandal! I stepped out of my comfort zone and found this pair of Elina Linardaki wedges at Saks that is a cross between a clog, a mule, and a platform! They are more costly but worth it! I love the detailing and the bright colors! I like to pair them with shorts or a jean skirt. Super fun shoes! I mean come on, how fun are these?! There you have it! These are the shoes I am rocking this summer! Happy Shopping! Evergreens! A Fresh & Fun Way To Eat Salad!